The Dow Jones Industrial Average today (Friday) reversed from a downturn in the morning and gained more than 200 points as energy stocks surged on rising oil prices. This morning, the U.S. Labor Department announced the unemployment rate remained unchanged at 5.1%. The economy added just 142,000 jobs in September, a significant miss from economic consensus expectations of 203,000. The markets gained as investors anticipated the U.S. Federal Reserve is now less likely to boost interest rates during the next FOMC meeting. The markets now predict odds of a little more than 50% that the Fed will tighten monetary policy in March 2016. In the afternoon, President Barrack Obama hailed 67 months of job growth, but warned U.S. economic growth could slow if Congress does not reduce its calls for austerity. The President called a possible government shutdown a "manufactured crisis." He also said he will not sign any short-term bill like the one he recently signed to fund the government for an additional 10 weeks. The S&P 500 Volatility Index (VIX), the market's fear gauge, dipped 7.4% on the day. 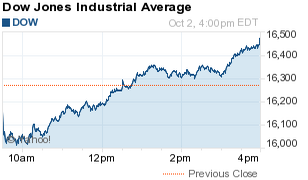 Stock Market News: All 10 S&P sectors showed gains of more than 1%, with energy stocks leading the way. The S&P energy sector added 3.8% after Baker Hughes Inc. (NYSE: BHI) reported a significant drop in U.S. rigs. The energy sector's biggest winner today was Bill Barrett Corp. (NYSE: BBG), which added more than 20% on the day. Oil Prices Surge: Oil prices were on the rise today on news U.S. production was slowing. WTI prices gained 2.0% to hit $45.64, while Brent oil prices added 1.1% to hit $48.22. Oil prices were under pressure earlier in the trading session as weak economic data and reduced threats to infrastructure from Hurricane Joaquin weighed on trader sentiment. Today's biggest volume traders: Exxon Mobil Corp. (NYSE: XOM) gained 2.4%, Chevron Corp. (NYSE: CVX) added 4%, and oilfield services giant Schlumberger Ltd. (NYSE: SLB) added 4%. Here's a breakdown on how Hurricane Joaquin can affect energy prices on Monday. On Tap Monday: On Monday, traders should keep an eye on the Gallup U.S. consumer spending measure, while England will report a critical monthly update on its Services PMI. Companies that report earnings include Container Store Group Inc. (NYSE: TCS), Hanger Inc. (NYSE: HGR), and Electro Rent Corp. (Nasdaq: ELRC). Stocks to Watch No. 1, MCD: The fallout from the ongoing FIFA corruption scandal is hitting the World Cup's largest sponsors. This afternoon, both McDonald's Corp. (NYSE: MCD) and Coca-Cola Co. (NYSE: KO) issued individual statements urging FIFA president Joseph Blatter to resign. Stocks to Watch No. 2, TWTR: Shares of Twitter Inc. (NYSE: TWTR) surged more than 6.5% as speculation about interim CEO Jack Dorsey's appointment to permanent CEO continues to flutter. Dorsey was originally the company's CEO for two years until he was ousted in 2008. With share prices rising and falling as this story plays out, investors should be asking if Dorsey should assume the role for the second time. You can find the pros and the cons of Dorsey's potential appointment right here. Stocks to Watch No. 3, GILD: Shares of Gilead Sciences Inc. (Nasdaq: GILD) were flat today after the company received a stock downgrade from investment firm Morgan Stanley (NYSE: MS). The company slashed its price target for the biotech giant to $127, which is still about a 35% premium from today's closing price. The stock was engulfed in part of the broader biotech sell-off fueled last week by calls for price controls on biotech specialty drugs from presidential candidate Hillary Clinton. Stocks to Watch No. 4, MU: Shares of Micron Technology (Nasdaq: MU) surged more than 7.7% after the semiconductor giant reported stronger than expected quarterly earnings and profits. The company's earnings per share (EPS) beat Wall Street expectations of $0.37 per share by $0.05. The firm's CEO said during a conference call the semiconductor industry's long-term fundamentals look strong.